The international soccer body's controversial president said on Tuesday that he'll step down, but it isn't the end of FIFA's corruption scandal. Just days after he won re-election to a fifth term, FIFA President Sepp Blatter said he is resigning from his position as the investigations into alleged corruption at the international soccer body continue to unfold. Blatter was re-elected as the group’s president on Friday, despite the fact that US authorities charged 14 people, including nine soccer officials, last week with allegedly orchestrating a long-running kickback scheme to enrich themselves. Blatter himself was not charged. At a surprise press conference on Tuesday, Blatter, who has served as FIFA’s president since 1998, announced his decision to step down. A new president will be elected at some point between December and March 2016. "I felt compelled to stand for re-election, as I believed that this was the best thing for the organization," Blatter said at the press conference. 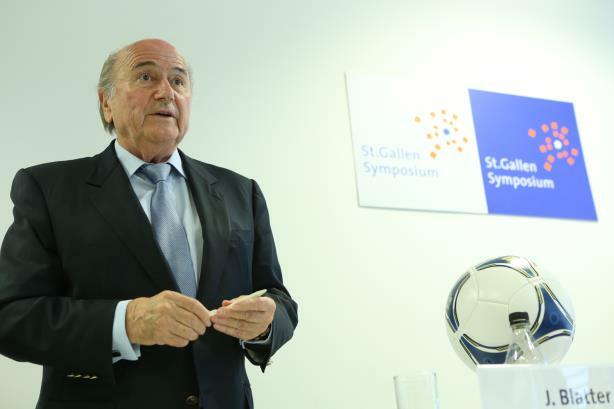 "That election is over, but FIFA’s challenges are not. FIFA needs a profound overhaul." Blatter’s resignation followed reports that FIFA Secretary General Jerome Valcke allegedly made $10 million from bank transactions that are a central part of the investigation into corruption at FIFA. Valcke is a top aide to Blatter. FIFA’s overall handling of the crisis has been lambasted on Twitter. The organization’s in-house team is handling crisis communications for this matter without help from an outside agency. Blatter began his professional career as the Valaisan Tourist Board in Switzerland's head of PR, and in the 1970s he served as director of sports timing and PR for watchmaker Longines. FIFA sponsors including Coca-Cola, McDonald’s, Visa, Budweiser, and Adidas have released positive statements on the loss of Blatter. Visa put out the longest statement, explaining that Blatter’s resignation is a significant first step towards rebuilding public trust. However, the company noted that more work lies ahead. "Transparency, integrity, and fair play must be the hallmarks of the new administration and Visa stands ready to work with FIFA towards these principles," Visa said in the statement. In the wake of FIFA’s controversy, there has been intense public pressure on the organization’s biggest sponsors to take a stand and withdraw. Many of the PR pros who reacted to the resignation on Twitter noted the group’s troubles are far from over. No, no - stop. I can't be FIFA president. I have a job. You guys. Blatter's ethics are banished. But without a face to put on corruption, what impetus does FIFA have to change aside from bad PR? Ultimately FIFA PR math based on one question: Does FIFA = Sepp Blatter? I wonder if it took a looming indictment to force hard answer.